RARE SIGNED Letters with added handwritten note! John F Kennedy - Letter on his US Senate stationary, signed "Jack" January 29, 1954. Also, he added a handwritten note, "I had thought this had been sent - Very Sorry about the delay". VERY RARE for him to add notes. In addition it was later in 1954 that JFK would begin to almost exclusively employ secretaries and the autopen machine to sign all his correspondence. Not only Evelyn Lincoln but many other secretaries for the rest of his political career. Using "The Robot that made a President" and other authentication resources we Guarantee For Life, this is indeed his RARE AUTHENTIC signature obviously made out to a friend. . A choice find and unquestionable investment. JFK authentic material continues to skyrocket in value. Offering a RARE Authentically Signed letter by John Fitzgerald Kennedy when he was in the house of Representatives in 1951 when he was representing the 11th DISTRICT OF Massachusetts. 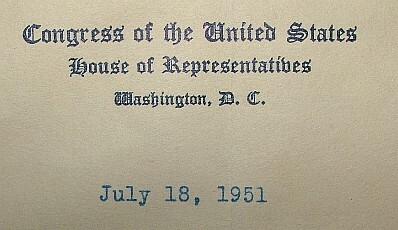 This is a letter on congressional House of Representatives stationary and dated July 18, 1951. Back in the days when JFK personally signed his own letters. After 1953 that wood no longer be the case. The typing on this is in blue and his name is signed in a dark blue. After 1953 John Kennedy began to use secretaries and the autopen machine to sign most of his correspondence. 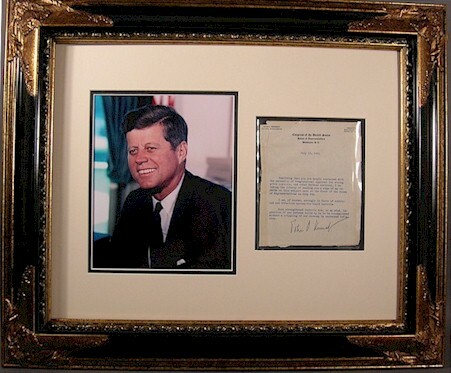 That is why it is VERY RARE for an AUTHENTIC JFK Signature to appear on the market . What most people think they have is instead a JFK letter signed by someone else, trying to duplicate his signature. Fortunately, his signature is very difficult for secretaries and even the most seasoned forgers we see today pawning their forgeries on the internet auction sites. To the trained eye these forgeries are obvious. This is why we recommend to our customers to NEVER buy a piece of paper signed by a historical figure like Kennedy, Lincoln, Jefferson and others. It is FAR SAFER to only invest in Signed Official documents such as letters on personal stationary or official Presidential Appointments. I cringe when I see forged Presidential signed pieces of paper sell for thou$ands on Ebay. Purchased by inexperienced victims. 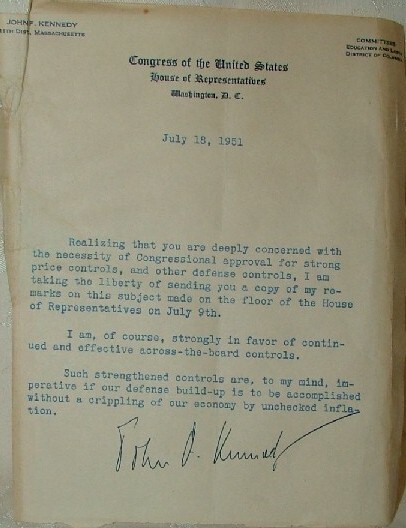 This is a GUARANTEED Authentically Signed letter which we have analyzed and compared to the #1 Kennedy signature study by Charles Hamilton, "The Robot that made a President". Considered the most extensive signature study done on any individual in the history of autograph collecting. An impressive piece of Kennedy and Political History. Beautifully framed and matted to 16x20".